South Suburban Savings: GONE! Get $50 Worth of Baby Genius for $19.99!! WOW!! GONE! Get $50 Worth of Baby Genius for $19.99!! WOW!! Sorry...this daily deal has expired! Click here to check out today's current Groupon deals! This is a great deal for the little one in your life! 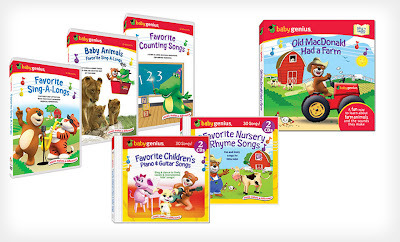 Head over to Groupon to get the Baby Genius 3 DVD and 2 CD collection for Toddlers for $19.99!! The set normally goes for $50 so this is a nice discount. These entertaining products entice children to learn their ABCs and expand their vocabulary. **Groupon now offers LOTS of GREAT DEALS on popular brand new products! Be sure to check all of today's "Groupon Goods" Deals HERE! *New to Groupon? CLICK HERE to join and get your deal and SSS will get a $10 referral credit.